Pasactore is a detached cottage with private access to a rocky beach at about 50 m from the house. 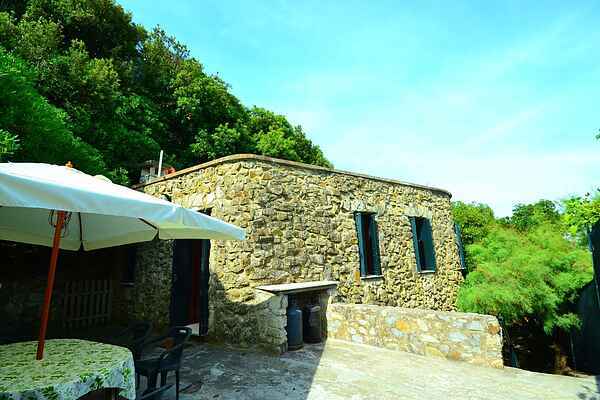 In order to reach this nice cottage, you have to use a footpath of about 150 metres, through the 44 hectare park with typical Tuscan vegetation of olive trees and pine trees. Through a small garden gate, you can reach a private beach that mostly consists of rocks and stones. You have a garden with garden furniture at your disposal, which offers shade and refreshment because of its location in the forest. It's furnished in a simple but comfortable way and located near the owner's villa. The roof of the house has been renovated and now offers a beautiful panoramic sun terrace! You can of course enjoy the beach, but there are also nice cities in the area to visit. It's located at 5 km from the charming coastal resort Castiglioncello. In Livorno, you could visit the La Venezia neighbourhood, which looks a little like Venice, with enchanting canals, bridges and squares. Drive a little further and you'll reach Pisa. Besides its inclined tower, Pisa has many more things to offer. The art towns of Volterra and Pontedera are also worth a visit. Particulars: The third bedroom (with bunk bed) can be reached by crossing the small courtyard. The house is not far from a railroad. This can cause some noise when the local train passes a few times a day. Castiglioncello is a charming town along the Tuscan coast. It has a lively centre and small villas and bungalows built around its pinewoods. A feature of the town is the many green areas and the calm environment in the centre. Restaurants, pizzerias and discotheques are dotted along the main road that winds its way along the rocks and beaches of Castiglioncello. Small boats and water bikes are for hire on the beach. Both here and in the fabulous park belonging to Castello Pasquini entertainment is arranged during the day and also at night. Castiglioncello is well known in Tuscany for its fantastic rock formations and its most gorgeous bathing waters. Suitable for everyone! The town has a railway station with connections to many of Tuscany’s best-known towns. Florence is one and a half hours away by train. By taking the train you arrive in the middle of the town without having to worry about the chaotic traffic or the immense problem of finding a parking place. Getting to Pisa and Lucca is, of course, even quicker.